With the threat of rain, thunder, and lightning looming over the day, 26,482 of us trekked to Brooklyn, NY for the NYRR Brooklyn Half Marathon. While the rain mostly held off, it overshadowed the day as we ran. At the start of the half marathon, the clouds blocked out the sun, but the humidity hung in the air to balance out the moderate temperature of the day. Moving slowly down the corral to the start and Washington Avenue slowly led to to the beginning of our race. Running a half mile south before turning right on Flatbush Avenue towards Grand Army Plaza and looping around the landmark to head back towards Ocean Avenue. With Prospect Park to our right, we traversed Flatbush Avenue and Ocean Avenue to turn onto Parkside Avenue, where we reached the 5k point and soon after turned into the park. The roughest part of the course is Prospect Park. A single loop around the park is a little over three miles, but contains the only hills of the course. While the temperatures held steady, the humidity made this portion even rougher. With one fairly steep hill and two that were not as bad, the fairly constant stream of onlookers cheering the runners on made it more bearable. It was as I reached mile 7, that the sun started to come out and I feared that the heat would increase. The sun lasted about as long as it took to run from the park and over the bridge that led onto Ocean Parkway. About a five and a half mile straight run from Prospect Park to Coney Island that tends to be long and uneventful, as long as the sun isn’t beating down for the entire run. The clouds helped make the run more pleasant than some of the previous Brooklyn Half Marathons I have run. Making it even more pleasant was the light rain that started around mile 10. It felt good to run in the warm rain as it steadily increased as I run further. When the rain became heavy, I was afraid of how bad it may get, but it soon it abated around mile 12. Running wet helped me keep cool for over a mile as I headed towards the finish, but it made the roads a little more treacherous due to puddles and more slippery conditions. With a short run down Surf Avenue, we ran onto the Coney Island boardwalk to complete our 13.1 mile journey. 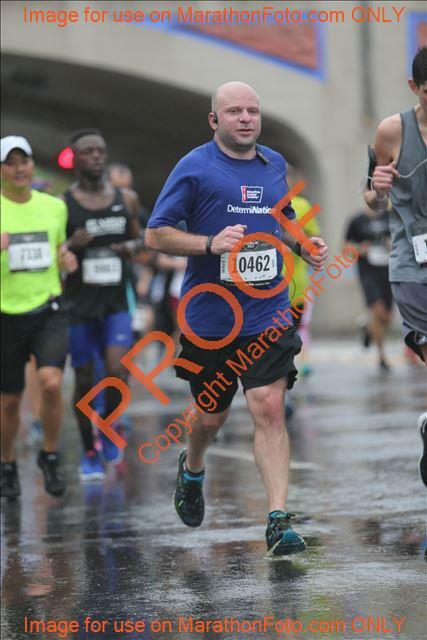 Even with the humidity and rain, I was able to complete the Brooklyn Half Marathon in 1:53:02, beating my time the previous year by 48 seconds and giving me a new PR to beat next time.